We were so excited on Tuesday when we heard a ringing sound from our computer. That was Mrs. Langston and her 1st grade class from Ohio calling us through Skype. They asked us several questions and we had a few for them. We wondered what it looked like outside since the weather was much colder than Hawaii. They were all dressed in long sleeve shirts, long pants, and even scarves. We showed them our t-shirts and shorts. There was a huge evergreen tree and a few other trees with bare branches right outside of their class window. When it snows, they have fun sledding. We wondered what it was like riding a sled down a hill. Next time we'll ask them. We shared some of our class work with each other. They worked on really nice Santas and we showed our decorated paper plate Christmas trees. They asked if we saw sharks in the water. Most of us raised our hands. Because of some problems, Mrs. Lee couldn't take any photos of their class because they would be too blurry. 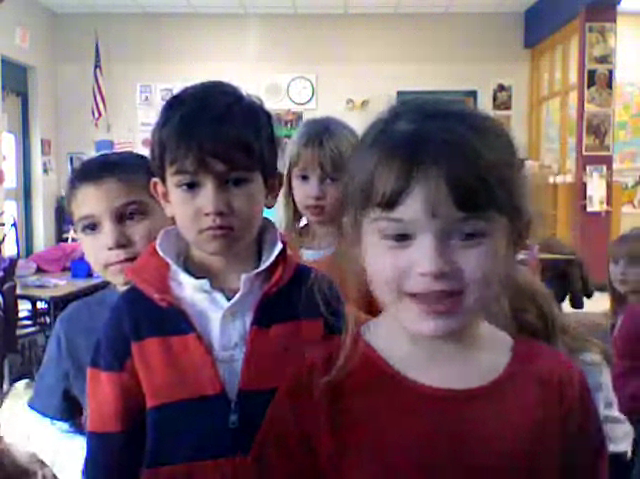 When we Skype with Mrs. Langston and her class next time, we'll take a few pictures of them. 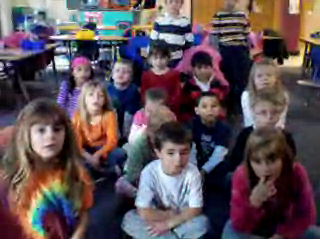 On Wednesday we Skyped with Mrs. Poulin and her Kindergarten class from Massachusetts. We both shared songs, artwork and questions. Our homes don't have chimneys so Santa probably walk through our door to deliver presents, but most of Mrs. Poulin's students said they have chimneys for Santa to come through. Our Kindergarten friends are really hard workers. They illustrated and wrote about a winter adventure they'd like to have with us. We will treasure this book! We sent them a Christmas Book Aloha Bear and they sent us the picture book Owl Moon. They also sent us Maple Candy which was so ono. Skype is a great way to talk to other students in different places around the world. We are excited to learn how we are the same and different.